For more than a year, a small group has met regularly in Toronto and Ottawa to talk about what's wrong with the CBC and how to fix it. This core group is made up of four concerned citizens: Kealy Wilkinson, Wade Rowland, Eric Koch and me. We consulted others: a mixture of about 40, mostly ex-CBC employees - former managers and senior producers from both radio and television, French and English. A few in our group came from the federal civil service, who for obvious reasons, prefer to remain anonymous. To be clear, our group did not want to wallow in nostalgia for a so-called golden era of public broadcasting. Nor did we want to be considered as just another bunch of disgruntled ex-employees. No doubt we will be accused of that, and more. We wanted our proposals to be non-partisan. Just it was the Conservatives in the 1930s who created the CBC, we learned that there are many in the Tory caucus today who still value public broadcasting. The same goes for the Liberals and the NDP. It was - and is encouraging. And we were concerned that our efforts could be derailed by some who feel that we are just a stalking horse for those ideologically bound, CBC-haters. Or that we were just another version of those lobby groups who dream of a return to "full funding." We are neither. We know that there are risks to what we were about to propose. But we think the risks are worth it. In November 2012, we submitted our brief to the CRTC's hearings for the CBC's licence renewal. Of the 5000 requests to intervene, only 80 were asked to come to Ottawa. We were among the 80. Distinctive, high-quality news and information and entertainment content, on Radio, Television and online. A stronger new media presence. Greater contextualization of news and information. Become a content provider that relinquishes distribution as technology evolves. Grant more program autonomy for the stations who know their audiences better than management in Toronto. A public broadcasting foundation to advocate for and generate new ideas about the role of the public broadcaster. A de-politicization of senior management and board appointments to restore the CBC's independence from partisanship. Our proposal was met with quiet encouragement from the Commission. Our next challenge: how to pay for this, assuming these goals are acceptable? Parliament must lighten the regulatory burden on commercial media. In short, to end CanCon requirements in order to maximize profits. 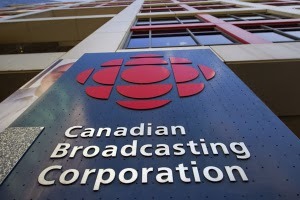 At the same time, commercials on CBC Radio and Television must end. Continued federal support for the public broadcaster, and commercial media distributors would pay a portion (7%) of their newfound income to support a public media entity which would no longer compete for those advertising dollars. Television budgets for Telefilm Canada and the Canadian Media Fund should be redirected to the public broadcaster. The present system of government subsidies to commercial media must end. Just as the Parliamentary appropriation to the CBC has been viewed as an unfair competitive advantage by commercial media, so too have the subsidies to media funds been unfair to the public broadcaster. By levelling the playing field so commercial media do what they do best, will allow the same for the public broadcaster. When those structural arrangement take place, both the commercial sector and the public broadcaster would find new sources of revenue unencumbered by an over-involved regulatory environment. For the public broadcaster, this would create an annual budget of $2.6b, more than enough to support a vital service to Canadians in both English and French, plus native language services. We understand these are radical ideas. But at a time when the CBC seems trapped into an endless cycle of reduced costs, irrelevant programming, and a disinterested public, we think it is time. In fact, long overdue. The entire media landscape is ripe for a major upheaval - and the public broadcaster should be the one media organization that shows the way. In effect, a re-invention of Canadian public broadcasting. Yes, multi-year funding is essential. Thanks for pointing that out.